I thought I wanted an iPad, but I'm still not sure. Not only because of the price, but I'd want something that actually works! Anyway come check out this great shot at an iPad with Retina Display Prize! Do you live overseas and enjoy shopping in the Unites States? Do you run your own eCommerce site and need to ship to international customers? Do you have loved ones overseas and wish to send gifts to them as safely and inexpensively as possible? If you answered yes to any of these questions then Parcelbound.com is for you!! Watch this video below and find out how. Parcelbound is a top rated international package forwarding company. They provide great savings to international customers wanting to shop on all their favorite USA websites stores, and saving them up to 75% on international shipping costs! 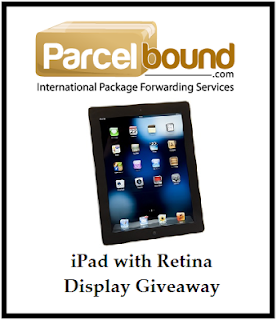 Parcelbound's service is also great for USA residents wanting to ship gift to friends/family living overseas. Get your own Parcelbound USA shipping address today! This giveaway is open worldwide and the winner will receive the iPad plus if you are outside the US you will receive FREE international/domestic shipping to show how the Parcelbound service works. Giveaway ends July 11, 2013 at 11:59pm est. One lucky winner will receive an iPad with Retina Display 16GB!! Disclosure: I received no compensation for this publication. My opinions are my own and may differ from those of your own. JamericanSpice is not responsible for sponsor prize shipment. This event was organized by MomPoweredMedia please contact tina@babycostcutters.com with questions or to see your business or blog featured on the next big event! I think people would use the personnel shopper service the most. I would at least! I really like how a person shipping something is given three different quotes on pricing. That's nice!